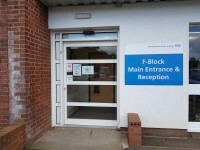 The Lucy Baldwin Building - F Block is located off Bewdley Road (A456) on the Kidderminster Hospital site. Blue Badge bays and standard parking spaces are available at the front of F Block. 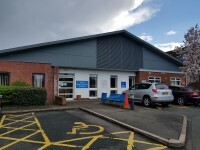 The nearest bus stop is the General Hospital (entrance) stop it is located on the Kidderminster Hospital site in front of the Main Hospital Entrance. 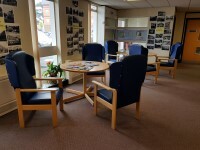 The nearest train station is Kidderminster, it is approximately 1.4 miles (9 min drive) from The Robertson Centre. This is the link for the home page of West Midlands Railways, the service operators of Kidderminster Train Station. 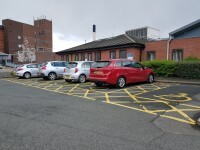 This is the link for the home page of Wyre Forest Dial-A-Ride, the operators of bus services to the Kidderminster Hospital site. 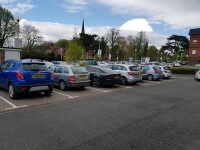 The car park is located just outside the F Block Entrance. There is/are 6 designated Blue Badge parking bay(s) within the car park. 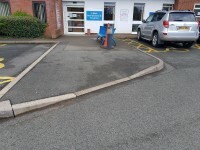 The dimensions of the designated Blue Badge parking bay(s) surveyed are 502cm x 358cm (16ft 6in x 11ft 9in). 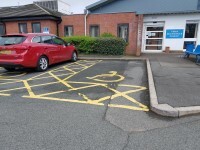 The nearest designated Blue Badge parking bay is approximately 7m (7yd 1ft) from the F Block Entrance. The bus stop is located outside the Robertson Centre main entrance. The bus stop is approximately 150m from the hospital and there are uneven surfaces between the stop and the Robertson Centre main entrance. 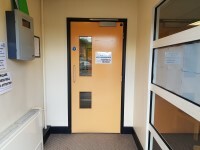 You are on Outside Access (F Block Entrance). Skip to the next section. The width of the door opening is 85cm. 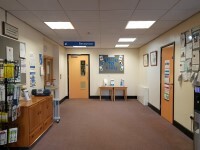 The reception point is located straight ahead and to the left on entering the F Block Entrance. 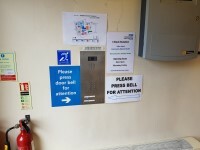 The reception point is approximately 5m (5yd 1ft) from the F Block Entrance. 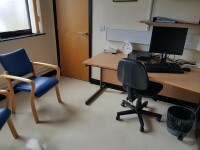 The height of the reception counter is low (76cm or lower). 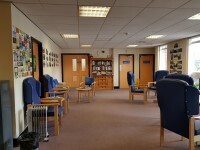 Music is played in the main reception. 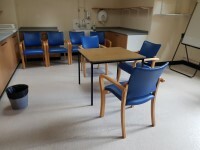 You are on Consultation / Treatment Room (Old Art Room). Skip to the next section. The name / number of the room surveyed was; Old Art Room. 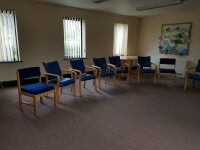 You are on Room / Area (Front Meeting Room). Skip to the next section. 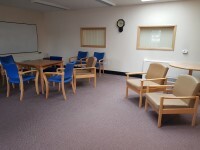 The name / number of the room / area surveyed was; Front Meeting Room. 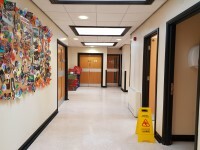 There is level access to the room / area. 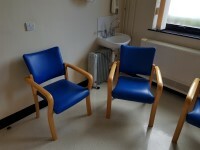 You are on Consultation / Treatment Room (Treatment Room 1). Skip to the next section. 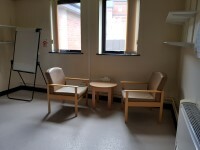 There is / are 4 consultation / treatment room(s) available. 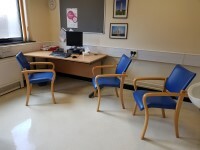 The name / number of the room surveyed was; Treatment Room 1. All tables are permanently fixed. 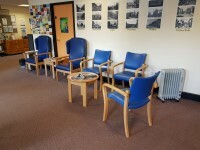 You are on Consultation / Treatment Room (Treatment Room 3). Skip to the next section. 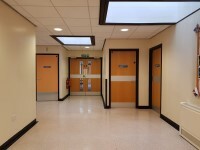 The name / number of the room surveyed was; Treatment Room 3. You are on Accessible Toilet(s) (Main Reception - Left Hand Transfer). Skip to the next section. 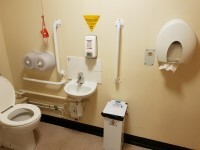 This accessible toilet is located at the back of the reception waiting area. 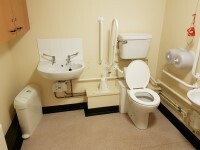 This accessible toilet is approximately 7m (7yd 1ft) from the F Block Entrance. 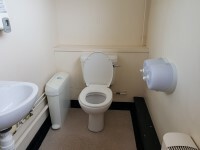 The dimensions of the accessible toilet are 234cm x 221cm (7ft 8in x 7ft 3in). The height of the coat hook is 178cm from the floor. 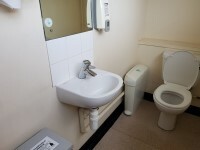 The toilet has a backrest and a cistern. The height of the toilet roll holder is 94cm (3ft 1in). The height of the wash basin is 72cm (2ft 4in). 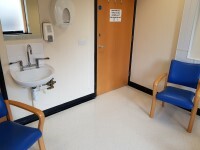 There is a second accessible toilet on the treatment corridor which is smaller. 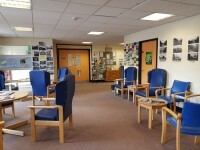 The female and male toilet facilities that were surveyed are located at the back of the waiting area. 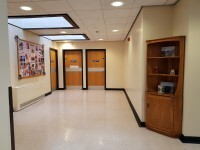 The female and male toilets are approximately 8m (8yd 2ft) from the F Block Entrance. The Robertson Centre link (new tab) - click here.